Mercy! 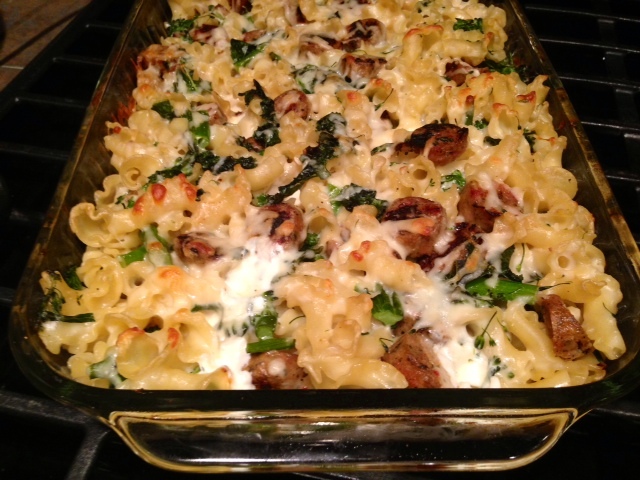 It’s been over a month since I posted a real, honest-to-goodness main dish recipe here. I’ve had sweets and breads and pancakes, but nothing that’ll really stick to your bones. I feel like I’ve been saying it all year, but it’s been utter madness lately. Work’s crazy, some travel, add in Thanksgiving, all the extra food and drinks around the holidays, and trying to finish everything up for the year. That means I’ve been keeping long hours and not eating remotely normally. Pretty much no fruits and veggies, and I don’t remember the last time I cooked a real meal. But last weekend it was so cold and dreary and I really wanted to get back to real life. I wanted comfort food, but healthy, and this dish fit the bill. 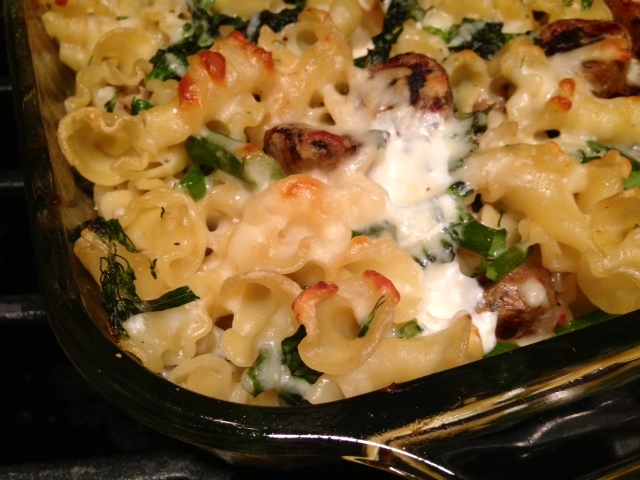 It’s got greens and crunch, tossed with golden sausage and firm pasta, all in the warm hug of creamy, garlicky bechamel and dots of gooey fresh mozzarella. Basically, it’s perfect. And fairly simple, all things considered. 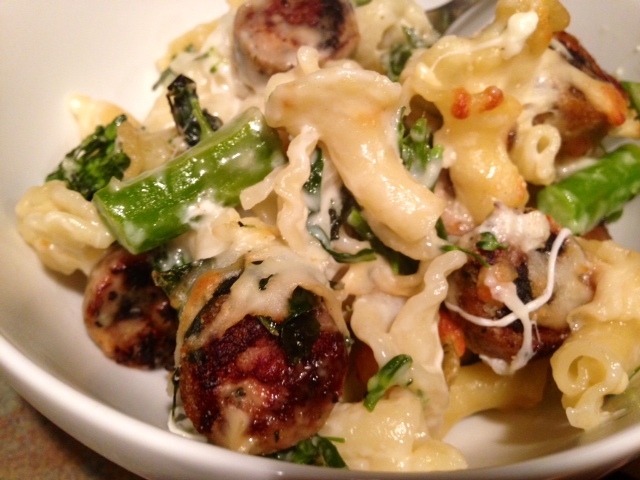 I was able to saute up the sausage and kale while the water boiled, then get everything else ready while the pasta and broccolini cooked, then stir everything together and pour it into the pan. Twenty minutes later, I had a big, golden, slightly crunchy masterpiece on my hands. 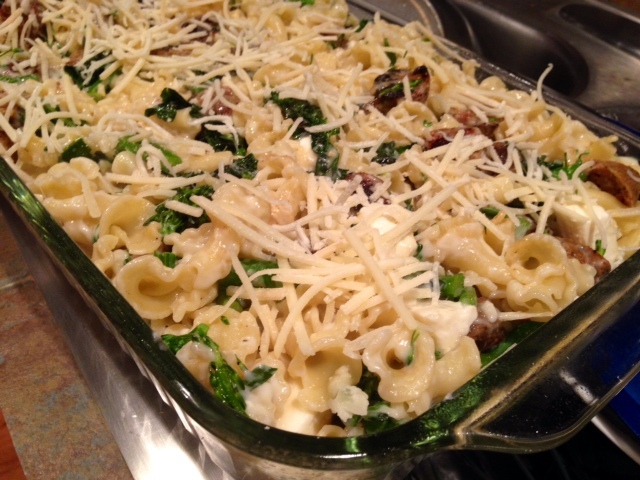 The original recipe from Smitten Kitchen calls for broccoli rabe, which I couldn’t locate at my grocery store. I used broccolini instead (which isn’t quite the same, but can do in a pinch) and added some sauteed kale for some extra health and texture. Everything else was just right! Set a big pot of water to boil and preheat the oven to 400 F.
Saute the sausage in a tablespoon or two of olive oil until nicely browned. Do the same for the kale in another skillet, with some salt and pepper. 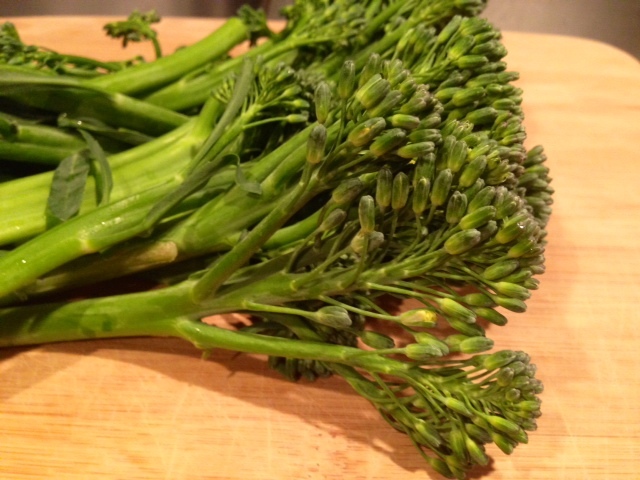 Cut up the broccolini—stems and leaves—into one-inch pieces. 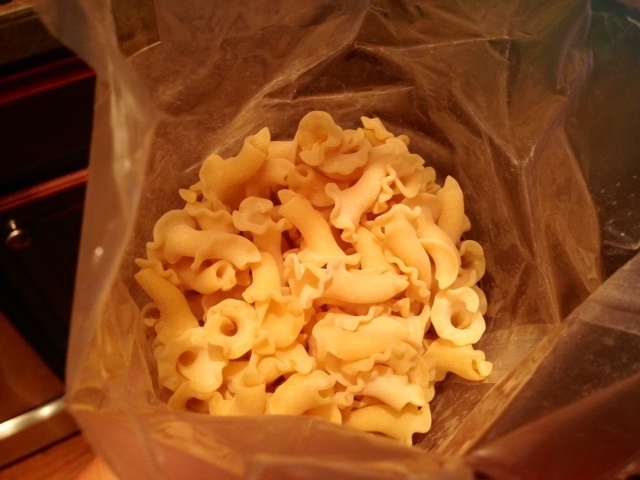 When the water boil, add a handful of salt and the pasta, and cook according to the package (don’t overcook!). 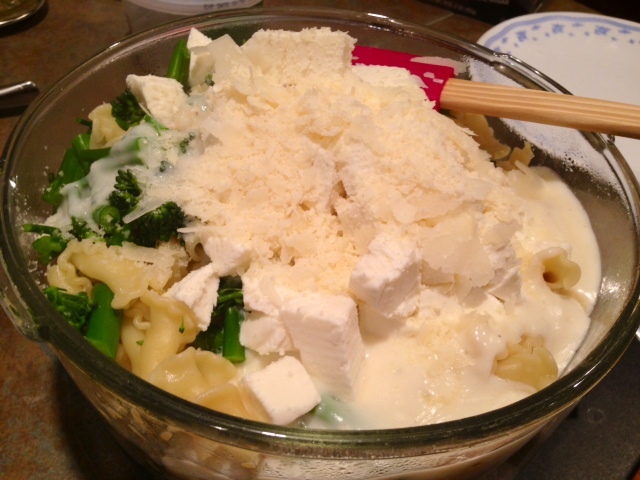 When the pasta is about five minutes from being done, add the broccolini as well. When it’s all done, drain and set aside (though if you time it right, you can pour it right in with everything else). In the same pan as the sausage, melt the butter on medium heat. Add the flour and whisk furiously until it’s totally incorporated and smooth, about one minute. 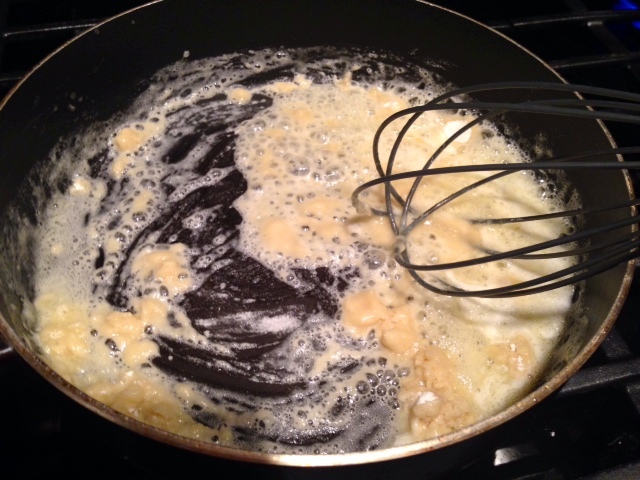 Add in a small drizzle of the milk, whisking constantly into the butter-flour mixture until it’s smooth. 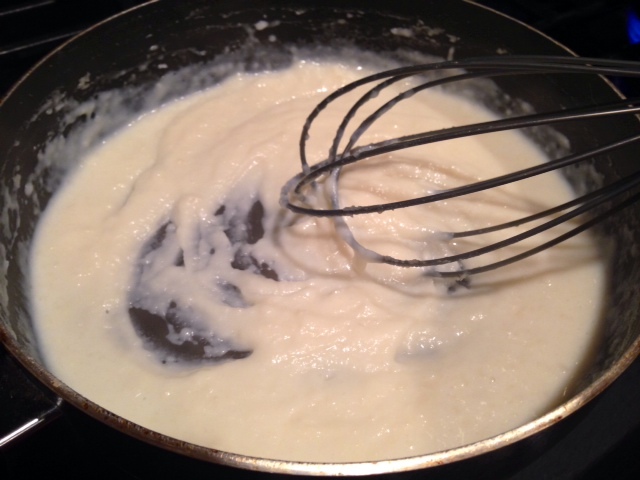 Continue to pour in a small amount at a time, whisking constantly. Once you’ve added a little over half of the milk (which is when I took this picture), you can add larger splashes at a time, but be sure to keep stirring the whole time. Once you’ve incorporated all the milk, add in the salt, garlic, nutmeg, and pepper. Make sure to taste it and adjust the seasonings as necessary. Lower the heat and bring the mixture to a lower simmer. Continue to stir frequently, for about another 10 minutes. It should thicken up beautifully. I’m always afraid it won’t, but it always does. 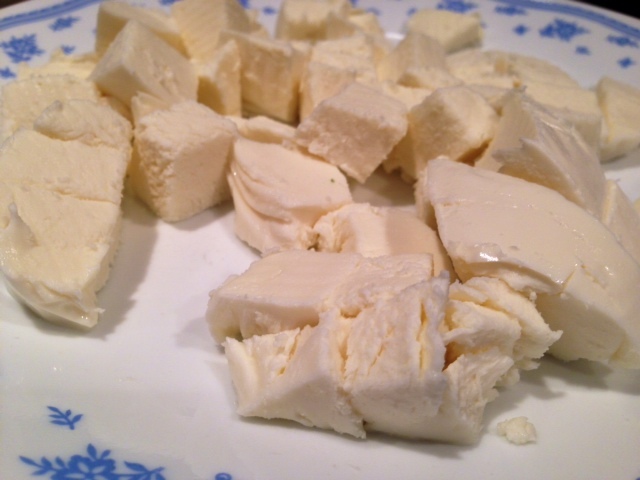 Cut up the mozzarella into chunks. Once you’ve got all your ingredients together, pour everything except half of the parmesan into a giant bowl and stir together. Grease or spray a 9×13 pan or 3-quarter baking dish and add the mixture, spreading it so it’s even. Sprinkle the remaining parmesan on top. 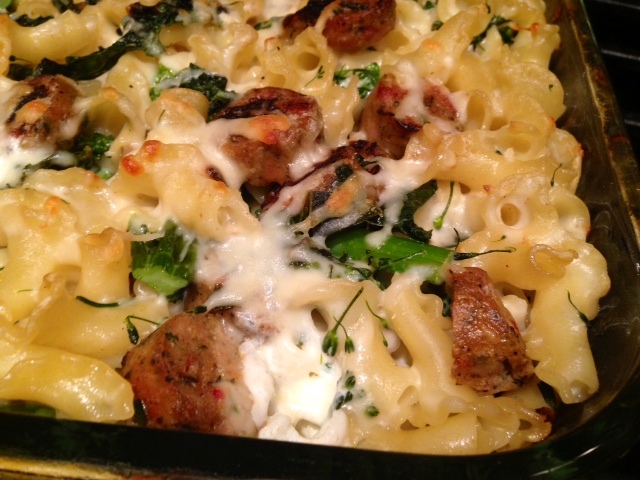 Bake for 20-30 minutes, until the cheese and edges of the pasta are all golden and bronzed, with a little crunch. The inside will be ooey-gooey goodness, so devour while it’s fresh. But the leftovers are great too, I ate on them all week! Heat the oven to 400 F. Bring a large pot of water to boil. Salt liberally and add the pasta. Five minutes before its cooking time is up, add the broccolini. 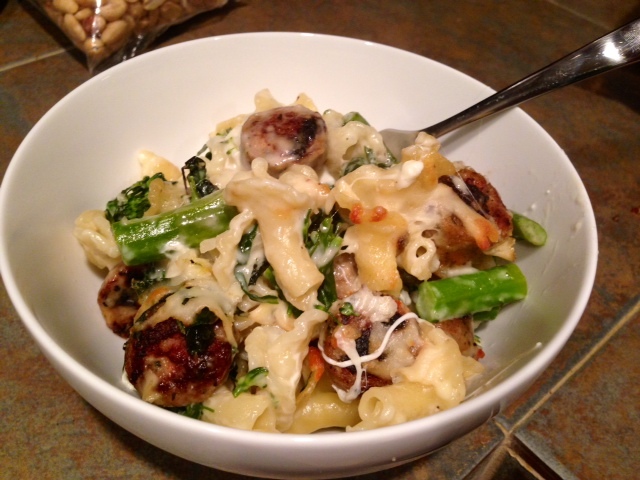 When cooked, drain and set both the pasta and broccolini aside. 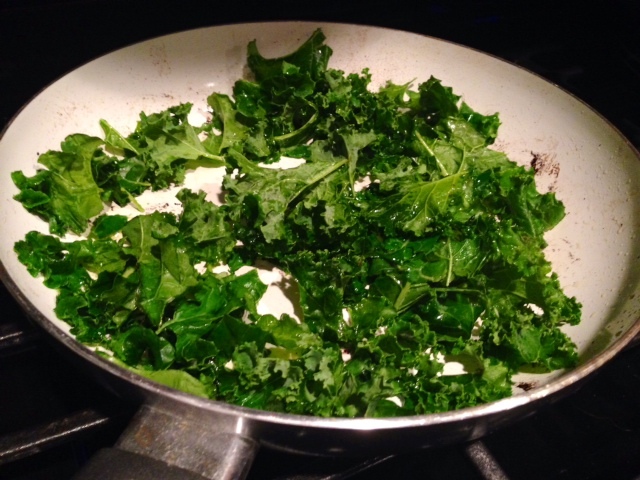 Saute the kale in a skillet with a couple tablespoons of olive oil and some salt and pepper. 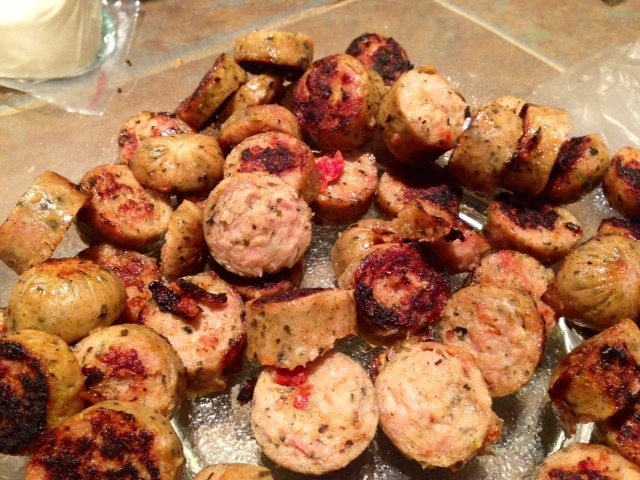 While the pasta is cooking, cook the sausage in a large, wide saucepan with 1 or 2 tablespoons of olive oil. Saute until golden, then remove with a spatula or slotted spoon. If it’s pork sausage, there will probably be some drippings, you can leave them in the pan (if there are a lot, go a little easy on the butter in the bechamel). Now for the bechamel. In the same saucepan you cooked the sausage in, melt the butter over medium heat. Once it’s melted, add the flour and whisk constantly until smooth, for one minute. 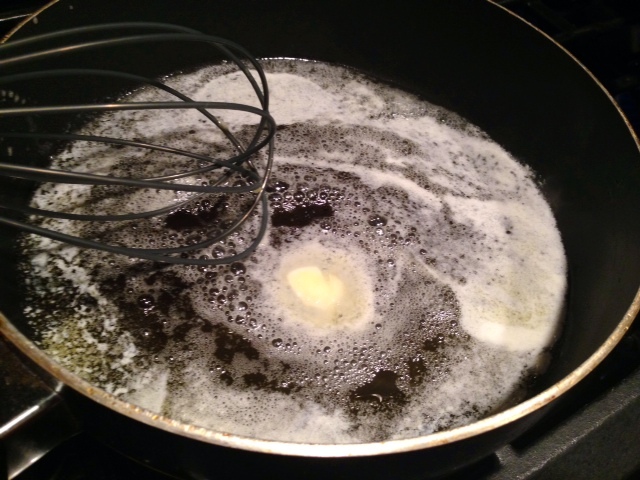 Add in a small drizzle of your milk, whisking constantly into the butter-flour mixture until it’s smooth. Continue to pour in a small amount at a time, whisking constantly. Once you’ve added a little over half of the milk, you can add larger splashes at a time, but be sure to keep stirring. 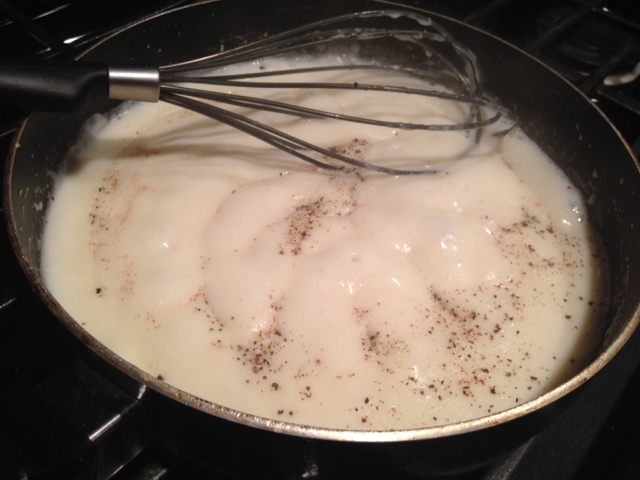 Once all of the milk is added, add in the salt, garlic, nutmeg, and few grinds of black pepper. Bring the mixture to a lower simmer and continue to cook it, stirring frequently, for about 10 minutes. It should thicken up beautifully. Make sure to taste a little and adjust the seasonings if necessary. 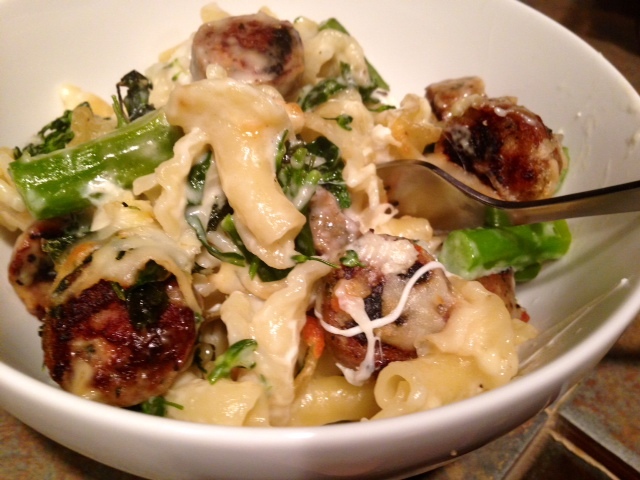 When everything’s ready to assemble, stir the sausage, kale, pasta, and broccolini together in a big bowl, then add the bechamel, mozzarella, and half of the parmesan or pecorino. Once you’ve stirred everything together, pour into a greased 9×13 pan or 3-quart casserole dish, and sprinkle the remaining parmesan on top. Bake for 20 to 30 minutes, until the edges and top are nicely bronwned.